Plants do not use the entire spectrum of light. The chlorophyll and carotene only absorb the light at the range of two particular wavelength(blue 400-470nm and red 610-720nm). The light is designed to produce the most efficient wavelengths of light to produce peak photosynthesis. With unique design and aircraft grade pure aluminum, it keeps cooler in temperature even after 18 hours continuous use without the worries of over heating. The average life span is about 50,000hours. It is low power consumption and high luminous efficiency. With standard E27 socket, it is easy to construct an effective indoor growing setup with minimal cost. 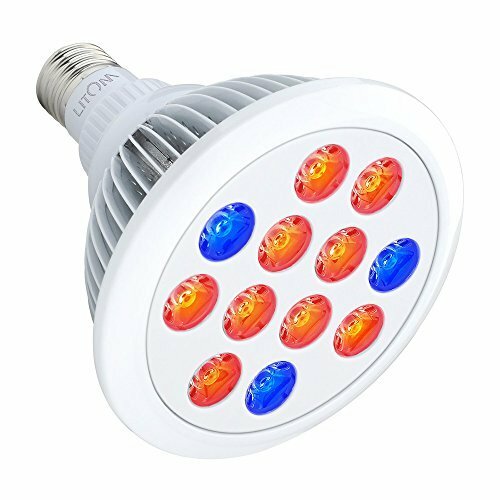 With 3 blue and 9 red light, the LED grow light gives off both red and blue light which is important for maximizing growth in plants. Red light is good for budding, flowering and fruiting when blue light is to promote leaf. Tips: Theoritically, 12X3W , 36W Actual power consumption：14.4W." Latest 36W theoretical power, 12X3W, 36W. High brightness. The more brightness, the better photosynthesis performance. Adopting high power LED chip, there are 12LEDs at 3W, totally 36 watt rated power versus the other sellers' version 12 LEDs at 1w. Same small size and shape, but triple brighter than 12w. Actual power consumption 14.4W.